I've harped way too often that your band is your brand, but it's true. I've also said this in other posts, and I'll say it again: Music is weird, man. It's this art form that takes time and thought, plus it's a form of self-expression, and that in itself is incredibly raw and real and beautiful. In that same light, however, it's how you make your money as well as the way you occupy your time and energy. Therefore, your beautiful, delicate artwork also has to be a structured brand that's recognizable, alive, and constantly relevant. I don't necessarily think this is a bad thing in the least, but it just requires that artists have a keen eye of what works and what doesn't, and what's good and bad for their careers from a marketing standpoint. A logo is a huge selling point of your career. It gives fans a graphic representation of who you are and will be put on your albums, merch, website, EPK – everywhere! You likely already know this, so let's skip to the point – how do you go about creating a memorable logo? Minimalism isn't only a great and classic method of design, but it also ensures longevity throughout your career. For instance, take the classic Beatles logo. It's just black text, but that font is now instantly recognizable, and it worked with their early, suited-up phase as well as their more experimental times. A lot of artists want to throw in an array of colors, designs, shapes, and other figures, but be careful. Keeping it simple and classic is effective. Colors evoke emotion, so choose them wisely. I, personally, prefer to stick with neutrals, but if you do want a bold color, make sure it isn't something too loud or a hue that won't work with your brand's voice. Fewer colors tone down confusion and save on printing costs, too. Also, be subtle with color! Using it in certain small places of your logo (i.e. a certain word, letter, or symbol) can make a huge impact. The above logo is from a client of mine who stuck with minimal colors, but in a way that's unique to the brand. 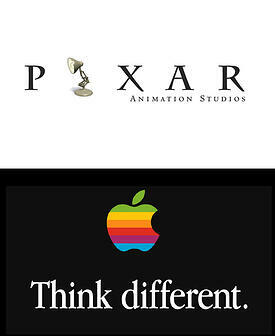 A lot of great logos have two pieces: one is the entire logo, and the second is an icon that can be used by itself. For instance, the Nike logo is the check with "Nike" underneath, but the "swoosh" is also instantly recognizable by itself. Another example is the Rolling Stones lips and tongue image, which can also be used in various configurations. When designing a logo, create an image that can be used either as a complete symbol, but can also be broken down without losing its meaning. Your logo is likely going to be made up of text with subtle images. Therefore, be picky about your typeface. You can use serif fonts to give a great, classic feel or sans-serif fonts to achieve a cleaner look with rounded edges. Above, you'll see serif fonts by Apple and Pixar, which give a more classic and regal vibe. You can try and make a logo yourself, or you can go to Fiverr and get five executions of a lousy clip art logo. But at the end of the day, I'd recommend seeking out a professional who can assist you in developing the perfect logo for your work. When trying to develop your own logo, sometimes you can get so caught up on "must-haves" that your mind isn't open to new possibilities that may actually work better. Getting a fresh set of eyes – especially those of a professional – isn't only a way to get a great and reliable logo, but it's also a way to get an unbiased concept you can use for your brand.